These heat exchangers are exact replacements to the heat exchangers offered by Volvo Penta Marine and other replacements. 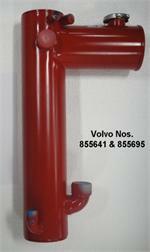 They work with the existing brackets, hoses, & fittings. Follow the links below to your heat exchanger. To place an order please use our secure online ordering.